Nandos Plymouth Old Town Street win Award! Congratulations to Nandos in Plymouth Old Town Street who supply chicken to the Monday Night team. 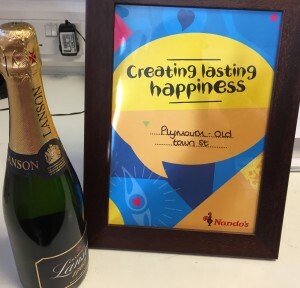 They have now been awarded the Nandos ‘Creating Lasting Happiness Award’ for the South West Region, in recognition of all their support and involvement with Plymouth Soup Run. They were chosen from 10 restaurants in their area.